Salvador Allende died 45 years ago today in a US-backed coup. Here's his final address, broadcast over the radio while he was barricaded in the presidential palace. 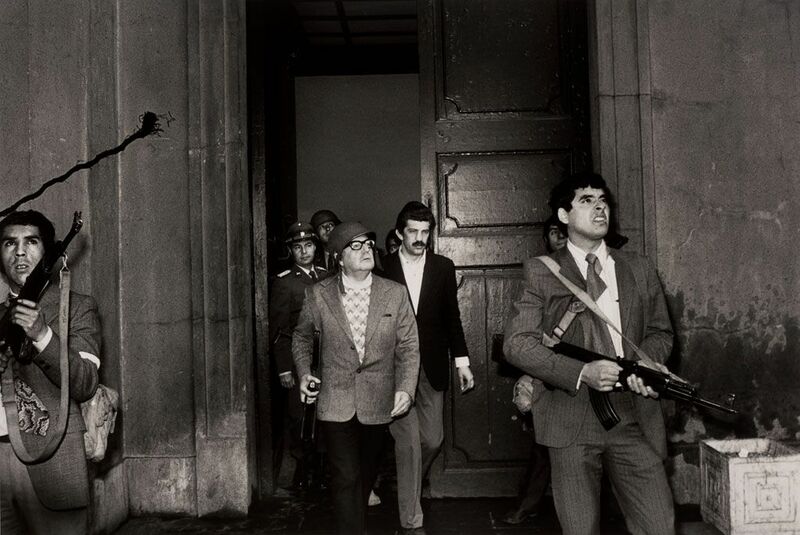 The last photograph of Salvador Allende inspecting the presidential palace shortly before his death. Surely this will be the last opportunity for me to address you. The Air Force has bombed the towers of Radio Portales and Radio Corporación. My words do not have bitterness but disappointment. May they be a moral punishment for those who have betrayed their oath: soldiers of Chile, titular commanders in chief, Admiral Merino, who has designated himself commander of the Navy, and Mr Mendoza, the despicable general who only yesterday pledged his fidelity and loyalty to the government, and who also has appointed himself chief of the Carabineros [national police]. Given these facts, the only thing left for me is to say to workers: I am not going to resign! Placed in a historic transition, I will pay for loyalty to the people with my life. And I say to them that I am certain that the seed which we have planted in the good conscience of thousands and thousands of Chileans will not be shriveled forever. They have strength and will be able to dominate us, but social processes can be arrested neither by crime nor force. History is ours, and people make history. Workers of my country: I want to thank you for the loyalty that you always had, the confidence that you deposited in a man who was only an interpreter of great yearnings for justice, who gave his word that he would respect the constitution and the law and did just that. At this definitive moment, the last moment when I can address you, I wish you to take advantage of the lesson: foreign capital, imperialism, together with the reaction, created the climate in which the armed forces broke their tradition, the tradition taught by General Schneider and reaffirmed by Commander Araya, victims of the same social sector which will today be in their homes hoping, with foreign assistance, to retake power to continue defending their profits and their privileges. I address, above all, the modest woman of our land, the campesina who believed in us, the worker who labored more, the mother who knew our concern for children. I address professionals of Chile, patriotic professionals, those who days ago continued working against the sedition sponsored by professional associations, class-based associations that also defended the advantages which a capitalist society grants to a few. I address the youth, those who sang and gave us their joy and their spirit of struggle. I address the man of Chile, the worker, the farmer, the intellectual, those who will be persecuted, because in our country fascism has been already present for many hours — in terrorist attacks, blowing up the bridges, cutting the railroad tracks, destroying the oil and gas pipelines, in the face of the silence of those who had the obligation to protect them. They were committed. History will judge them. Surely Radio Magallanes will be silenced, and the calm metal instrument of my voice will no longer reach you. It does not matter. You will continue hearing it. I will always be next to you. At least my memory will be that of a man of dignity who was loyal to the workers. Workers of my country, I have faith in Chile and its destiny. Other men will overcome this dark and bitter moment when treason seeks to prevail. Go forward knowing that, sooner rather than later, the great avenues will open again where free men will walk to build a better society. Salvador Allende (1908–1973) was the president of Chile from 1970 to 1973.